If cougar has approached you, it is an indication that you have come into your own power. Now is the time to take the lead of a situation. Now is the time to be strong. Cougar is here to let you know that now is the time to leap into all the opportunities made available to you. Using the power of intentions, be clear with your purpose and define where you are heading. Below are the many associations and possible meanings behind the cougar totem animal. The cougar is happiest prowling in shadows during the magical hours of dusk and dawn. She brings strength, courage, instincts and sensual mystique. She is powerful and solitary teaching us how to use power so that we may become effective, fair leaders who do not abuse power. She is especially auspicious for women and individuals looking to connect with primal Feminine awareness. She asks that you balance your feral instincts with wisdom and patience. Take the time to learn through observation. Save your energy and take action only when the time is right. Also take note of any emotional upheavals or clashing of passions. You will need to cultivate serenity and fairness. Remember though the powerful cougar may be difficult to work with, she will grant you formidable power if you listen carefully to the wisdom she has to offer to you. The cougar is also here to remind us to balance our power. It is important to know when to be gentle and when asserting your energy will be more productive. Perhaps the most important lesson we learn from this power animal is how to use our leadership qualities without the presence of ego. If your animal totem is the cougar, then most likely you are a natural leader. You are good at setting boundaries and are clear when someone disrespects those boundaries. When you are happy, your happiness is heard and visible by all that surround you. However, many fear your roar. You know how to be seen or not seen, as you posses the knack for camouflage. As an totem animal, the cougar gives you the gifts of unique self expression, sexual charisma and enigmatic charm. Cougar strengthens your connection with the spirit world and strikes fear in even the bravest of hearts. You can prevail against all odds, and you are the monarch of your domain. Cougar leaping into your dreams can mean several things depending on what she is doing and the context of the dream. If you see her sleeping or resting, this can suggest that you have strength, elegance and are well-respected by your colleagues and peers. It also means that you have accomplished your goals and now is a good time to relax before taking on the next project, idea or goal. If cougar is on the prowl, this can reflect your passion, sexuality and represent successfully completing your goals. If she is traveling, she is letting you know you need to check the perimeters of your boundaries. Ask yourself if your boundaries are being respected. Sometimes, cougar can symbolize female hostility and intensity, which implies danger or life threatening situations. 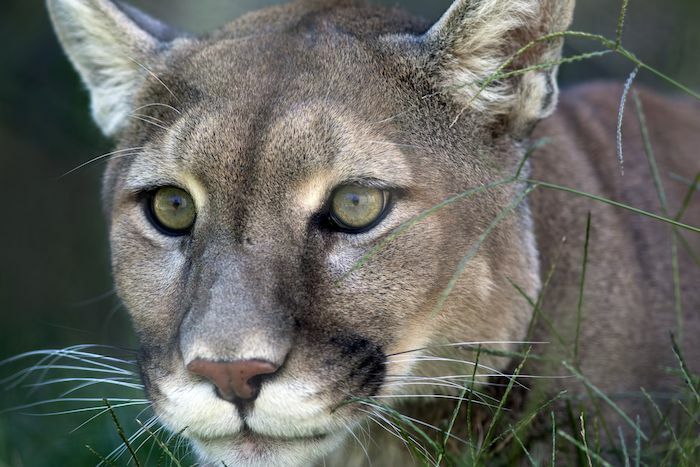 Cougar can suggest that your social position and well being may be in jeopardy. Make sure to pay attention to your emotions when cougar visits your dreams. This will give you significant clues as to which message cougar is trying to convey to you. Teach me quietness and stealth of purpose. “I am open to working with my own power and harnessing it for the abundant good of myself and all”. 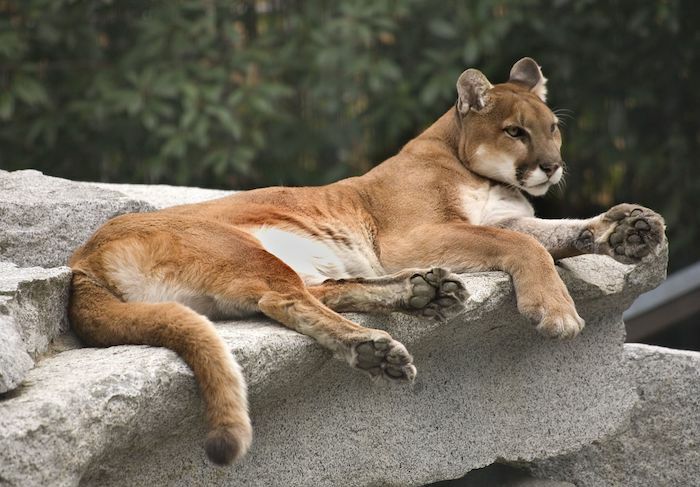 Post your ideas and comments about the cougar spirit animal by using the comments section below. A recent ex girlfriend and a woman I met a long time ago were at my house. They were talking in an upstairs room so I gave them space and went to the main floor. A huge mountain lion approached the front porch, climbed onto a snow bank and looked at me through a window before wandering away. Some dude I don’t know, I think a friend of the second woman I mentioned, came by. The three of them seemed to be getting along very well and I was the odd one out. Went outside the back of the house. It was summer. Hiked up a hill and came within a couple feet of the cougar in tall grass. Then there was very shrill screaming from inside the house and I woke up. Cougar came to me 1 Night and had something to tell me never found out what it was though? Can anyone help me? I was at a zoo watching the lynxes, and they were… in love. I walked by, and the male saw me, stopped, and walked up to me. He didn’t growl or anything. And he looked right into my eyes. I wiggled a twin by the fence and played with it for a few minutes. Why would he just leave his mate like that to see a stranger? If anyone knows what this means, please tell. I feel like your reading has rung true in my own need for retraint, mindfullness, self reliance and measured use of my natural passion and command. Thank you.